February 11, 1894: Fire destroys Duluth’s first Board of Trade building. On this day in Duluth in 1894, fire destroyed the Board of Trading building that had stood at 302–304 West Superior Street since 1885. The fire was first discovered at about 12:20 in the afternoon. Trade commissioners attempted to extinguish the blaze, but the building’s hose produced no water. When firefighters arrived, they found nearby hydrants frozen shut, causing a valuable loss of time. Firefighting efforts were also hampered when Engine No. 3 broke down and another engine had to be called in. 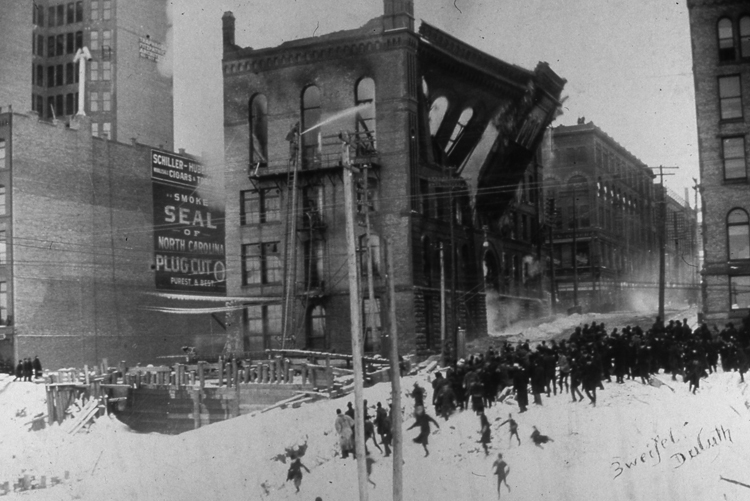 Cinders reportedly six-feet long were carried on wind two blocks west, past the St. Louis Hotel. Citizens doused the cinders in water or shoveled snow atop them to keep the fire from spreading to the Burrows Block and other nearby structures. Some even fell upon fire department horses, setting their blankets aflame, but these were quickly extinguished by citizen volunteers who tended to the horses so that the drivers could help their fellow firemen battle the blaze. They fought the flames for nearly half a day. At 11 p.m. the east wall of the building collapsed, and firefighters along Third Avenue had to flee a downpour of red-hot bricks. By 2 a.m., there was little left of the building. It was replaced the following year with a new Board of Trade building at 301 West First Street.